Retrospective Scooters has specialised in restoring and maintaining vintage Vespa and Lambretta scooters for over 20 years . Changes in environmental issues have put pressure on old style engines and we are at the cutting edge of applying new technologies to vintage design. We've sourced a range of new modern classic petrol engine scooters to compliment our vintage restorations. We develop and manufacture our very own electric conversion kits for all vintage Vespa & Lambretta scooters and we also stock Niu electric scooters and electric mopeds. Quite simply vintage scooter restoration, maintainance, servicing and repairs is what we love to do. 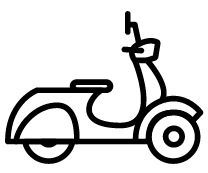 Retrospective was founded in 2000 because of our love of classic Italian scooters, it's what we're famous for around the globe. A revolution in classic scooters. We have developed the worlds first electric motor conversion kit for classic Vespa & Lambretta scooters. Authentic classic looks and electric power all in one scooter. For some, petrol is still the only way to go. You may be a long distance traveller or need a bit more power and speed. We've sourced a number of classic looking but modern petrol scooters from Royal Alloy and Vespa too. Niu electric scooters and mopeds are the best all round electric bike for the urban traveller with a range of scooters available. Great styling, fantastic features and tested reliablility all combined to offer a great overal package. "The only place to go for scooters in London. Brilliant AND honest service from people who genuinely love what they do." "I've given Niall a brief of what I want for my Scooter that he & his team are restoring. I had my fingers badly burnt elsewhere and it's been a pleasure to deal with someone professional in how they go about their business. " "Scooter tastic , everyone working here has a passion for their job." "True experts who are a treat to talk to. There is nothing they do not know when it comes to classic scooters."